Developed by FNSS to meet the needs of Turkish Land Forces Command, the PARS 4x4 Anti-Tank Vehicle (ATV) makes its first world appearance at Eurosatory 2018, where one of the two prototypes of the vehicle produced for qualification tests is being displayed at the FNSS stand, giving visitors to the event the opportunity to inspect up close a fully mission-equipped vehicle. The two prototypes, produced as part of the ATV project, will spend the coming months undergoing qualification tests once the manufacturer’s verification tests have been completed. The PARS 4x4 ATV has been devised as a vehicle that offers both speed and high maneuverability under all terrain conditions, with sufficient firepower to destroy enemy tanks and other armored units from a distance, and with the ability to engage second targets following a rapid change of position. Drawing upon its vast experience and innovative approach, FNSS has come up with a very special amphibious vehicle that is capable of meeting these challenging requirements simultaneously. Most noteworthy among the PARS 4x4 ATV’s features is the positioning of its power pack at the rear of the vehicle. With the placement of cooling grate and exhaust on the upper body, this positioning allows the vehicle to go amphibious without prior preparation, thus granting it the best amphibious capabilities in its class and further allows the PARS 4x4 to man oeuvre at higher speeds. All these features, which can only be expected from a vehicle with a rear-positioned power pack, grants the PARS 4x4 with critical capabilities in moving away rapidly after launching an attack. Mobility: The PARS 4x4 features an axle and steering system that is designed to give the vehicle a small turning radius, while the long suspension movement range enhances the vehicle’s performance over rough terrain. 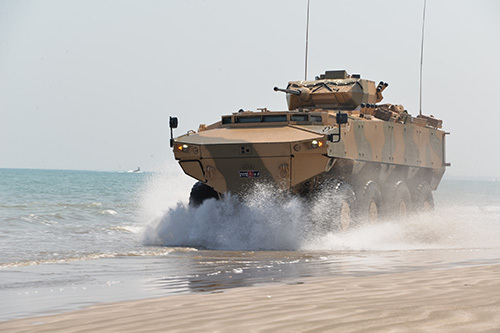 Although the PARS 4x4 is an amphibious vehicle, no concessions have been made in the vehicle’s ballistic or mine protection levels. Situational Awareness: The rear positioning of the power pack gives the driver a wide field of vision, while the integrated camera system provides the driver with full forward and rear situational awareness. Survivability: The PARS 4x4 has been designed with superior ballistic and mine protection, and uses special armour material that ensure weight optimisation. The rear positioning of the power pack also helps reduce the vehicle’s thermal signature. Weapon System: The PARS 4x4 is armed with an unmanned, remote-controlled anti-tank turret, also of FNSS design. In addition to ballistic protection, the turret also has two anti-tank missiles and a 7.62 mm machine gun. The turret recently performed its first firing test with the anti-tank missile, during which it successfully hit its target at maximum range. Launched by the Undersecretariat for Defence Industries (SSM) and conducted with FNSS as the prime contractor, the Anti-Tank Vehicles (ATV) project covers the development, qualification and delivery of a total of 260 vehicles that include the tracked KAPLAN-ATV and wheeled PARS 4x4 ATV platforms. The project contract was signed on June 27, 2016, and entered into effect on October 14, 2016.